Simply carry on another 400 yards or so from the Scoot Skelly mark,and you'll find a sandstone outcrop on the face of the grassy shore.This is the Caiplie Coves,a series of caves of varying depths into the hillside.Just past these caves is a flat rock formation which is the mark you're after. 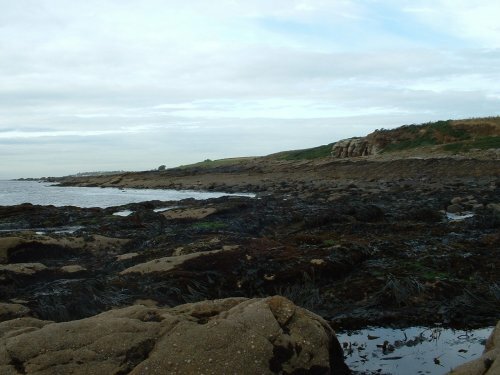 This view of the mark is taken at half tide to show that it is possible to fish this area from low water right up to full tide by simply coming back along the skelly as the water rises.The flat rock area extends inshore right to the beach. 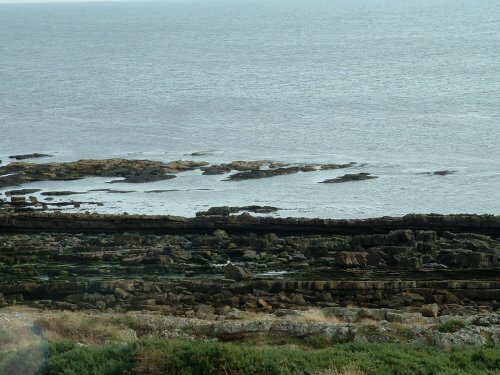 Although likely to be less productive than the Scoot Skelly mark,the benefit here is that you can fish it right back from low water without fear of being cut off,and it's much more rough water friendly,as well as being more accessible on neap tides.This mark is probably nearer Crail than Cellardyke and so can be reached by taking the coastal walk from the Crail end if you prefer. Catches should be cod and wrasse right through the year,with larger cod in the winter months.